Is It Dangerous to Quit Spice or K2 Cold Turkey? K2, or Spice, is synthetic marijuana made by spraying shredded plant material with a synthetic chemical compound similar to THC, the psychoactive ingredient in marijuana. Spice and K2 abuse can lead to a host of medical issues – including heart problems and the onset of psychotic symptoms. Spice is branded under at least 140 different names. 6 Street names for K2/Spice include Bliss, Genie, Sohai, Black Mamba, Fake Weed and Bombay Blue. As an uncontrolled substance, the exact ingredients and potency of any given sample of Spice can only be guessed at – placing users at risk of dangerous drug interactions and other toxic exposures. The severe if not lethal health effects of Spice or K2 are hard to ignore, and should compel users to seek medical evaluation and/or professional substance abuse treatment. Inpatient recovery centers: Inpatient facilities require you to stay at the facility 24 hours a day. These centers provide treatment around the clock, which usually includes therapeutic activities and medical management of withdrawal symptoms, when necessary. Outpatient recovery centers: An outpatient recovery program will consist of regularly scheduled appointments that may include counseling or behavioral therapy. Outpatient treatment allows you to maintain your normal day-to-day activities while undergoing different types of treatment interventions. Group counseling: Group counseling is incorporated into outpatient and inpatient substance abuse treatment. It involves meeting with a counselor and around 5 to 10 other individuals recovering from some type of addiction. Group therapy helps you by establishing peer support and reducing feelings of isolation. Individual counseling: Individual counseling allows you to one-on-one with a trained therapist Counselors help those struggling with addiction by helping them recognize addictive behaviors and motivating them to achieve and sustain abstinence. 12-step programs: 12-step programs approach addiction in a structured step-by-step manner to help attain and maintain sobriety. These programs typically include group meetings, and they focus on cognitive, social and spiritual life changes. Some addiction treatment programs are based on a 12-step model, but attendance at 12-step meetings can occur outside of the treatment setting, as well. Dual diagnosis: Dual diagnosis programs help individuals who suffer from both an addiction and a mental illness. These programs focus on treating both the psychiatric conditions and substance abuse at the same time through a variety of methods. Increasingly, more substance treatment programs specialize in recognizing and managing dual diagnosis issues. This decline was attributed to a growing awareness of the risk of using synthetic marijuana among this age group. Despite the encouraging decline in use, these products were still the third-most popular drug among both 8th graders and 12th graders. Fortunately, many of the same treatments available for adults are also available for teens. 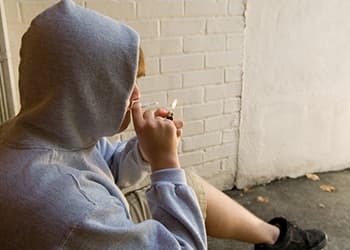 Teen Addiction Anonymous is an organization that began in 1999 to help young adults suffering from addiction, and it follows the same 12-step programs used by adults. Teens may also participate in wilderness retreats with other youth facing similar substance abuse issues. These programs combine inpatient addiction treatment with activities such as backpacking, horseback riding and leadership courses. Up to 50% of those who receive substance abuse treatment relapse. The highest risk is in the first 60 days following initial interventions. 2 To maintain recovery and to minimize this relapse risk, many who’ve completed a period of formal addiction treatment will plan for and engage in various aftercare activities. Aftercare refers to any treatment followingyour completion of a rehabilitation program. Often, aftercare includes support groups, follow-up meetings or additional individual counseling sessions. Sometimes, relocation to a halfway house or other sober living setting will be a part of aftercare. After using Spice for a long period of time, your body may become accustomed to having the drug in your system. When this occurs, you may experience withdrawal symptoms when you try to quit the drug. Because Spice and K2 are made with a variety of chemicals, these withdrawal symptoms can vary based on geographical region and differences between users. Because so little is known about Spice, withdrawal can be unpredictable and potentially dangerous. It is important to seek medical attention and to be honest with your healthcare provider about how much and how often you were consuming Spice. No medication has been approved to help people detox from synthetic weed. However, several medications have been studied for their effectiveness in treating marijuana withdrawal. These may helpful for treating synthetic cannabis withdrawal. Many people experiencing withdrawal symptoms from Spice/K2 may also be given medications for symptoms such as anxiety, nausea, and headaches. Quitting cold turkey can be risky because the withdrawal may be unpredictable and unpleasant. Case reports have noted seizures, hallucinations and sudden death. If you develop severe drug effects such as these, seek medically supervised detox at a professional treatment center. Helping a friend or family member who is struggling with an addiction can be difficult. Before approaching them, remember that the person with the addiction is ultimately responsible for his or her recovery. Approach the person with a gentle and caring attitude. Make sure he or she is not under the influence of Spice or K2. Explain why you are concerned and use non-confrontational language. You may want to mention specific behaviors or incidents that have affected you as a result of his or her addiction. Never approach the person in an angry or threatening manner. Encourage them to attend treatment.Try to open a two-way dialogue in which you can openly discuss the person’s thoughts and fears about treatment. Understand that they may not be open to this idea at first, and never threaten, blackmail or shame them. Remind them that many treatment options exist, and what’s important is finding one that meets their specific needs. The following are some tips that may be helpful as you or your loved one begins your recovery from Spice addiction or K2 addiction. If you have been using Spice or K2 for a long time or have tried to quit and relapsed, addiction treatment at a recovery center can provide the help you need for lasting sobriety. Detoxing from Spice or K2 can be difficult and dangerous alone. Many benefit from the medical attention and supervision found at a detox center or other formal treatment facility. Talk to your healthcare provider, who can offer encouragement and recommendations. Support groups, such as Narcotics Anonymous or Marijuana Anonymous, are free and helpful. Avoid triggers: Stop hanging out with friends who are still using Spice, avoid stores where you would purchase it and get rid of any paraphernalia. Travel to a remote treatment facility to escape your current using environment. Is Smoking Spice Safer Than Smoking Marijuana? Spice can be more toxic and more addictive than traditional marijuana. Smoking Spice or K2 is not safe. Due to its potency, it can be more toxic to the brain and more addictive than traditional marijuana. The ingredients used to make Spice vary in strength and chemical makeup. So you can never be certain what you are putting into your body. Some Spice products contain chemicals that could have lethal consequences when combined. What Are the Long-Term Effects of Smoking Synthetic Marijuana? The long-term effects of smoking Spice or K2 are not known. To date, limited information exists on the safety of many of the chemicals contained in Spice. What is known, however, is that Spice abuse can lead to a substance dependency and result in potentially dangerous withdrawal symptoms. Are Spice and K2 the Same Thing as Herbal Incense? Spice and K2 are often marketed under the name “herbal incense,” “herbal smoking blends” or “potpourri.” These names are misleading. While typical incense is burned for its pleasant smell, Spice and K2 are smoked. Spice and K2 are addictive, psychoactive substances that are harmful to your body.
. Weinstein, A.M., and Gorelick, D. A. (2011). Pharmacological Treatment of Cannabis Dependence. Current Pharmaceutical Design, 17(14), 1351–1358.
. National Institute on Drug Abuse. (2018). Available Treatments for Marijuana Use Disorders.